Did you get any pregnancy cravings while you were pregnant? I don't remember too many with my first. I did enjoy a few more things that I would have normally ate, like a few more poutines and nachos but otherwise I still ate quite healthy. For baby #2 it is pretty much the same, I am having a few indulgences but still aiming to stay on track. My craving this time around though is banana baked goods. I could literally eat banana bread every day. Oddly, I am not actually craving real bananas, just banana baked goods. I have never been a pure banana lover. Even now I really only eat the excess of what my little one doesn't it to give baby #2 some potassium. There is a cafeteria in a building across the street from my work and I swear they make the best banana bread I have EVER had! I can guarantee it is not healthy and potentially soaked in melted butter after it is baked but honestly BEST EVER! It is dangerous really. I tend to treat myself maybe once a week with it and for the rest of my cravings I go to recipes that are a bit more figure friendly like my Gluten Free Almond Banana Bread. 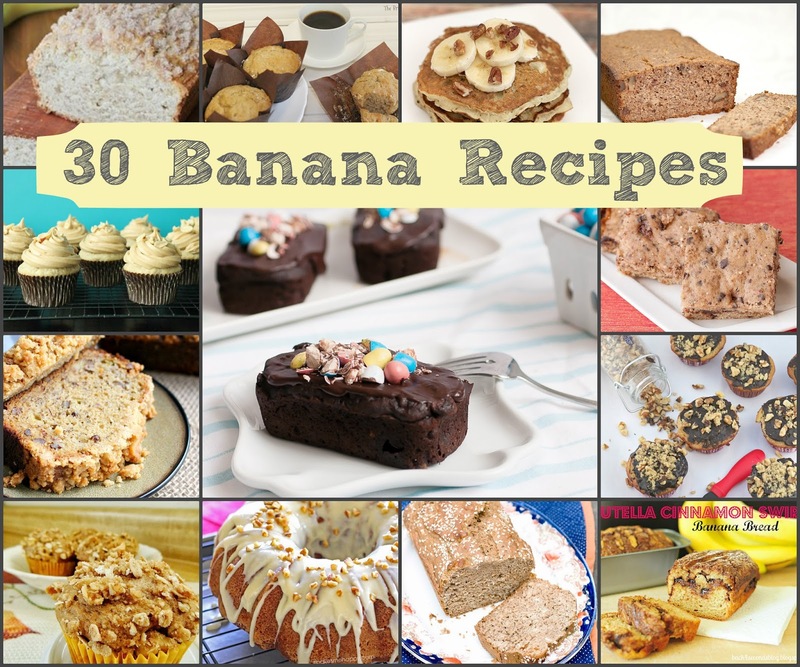 Since I need to mix up my banana baking and try some new recipes I have asked some blogging friends and scoured the web for some delicious banana baked goods and created this round up for you. Some healthy, some not, but all 30 Banana recipes will satisfy any banana craving.